Everybody can sleep badly some of the time. Some people sleep badly all of the time. Sometimes we can be deceived as to how much sleep we’ve had. It seems like we’re awake for ages but actually we got a lot of sleep. So what is actually going on in reality? Scientists have measured the brainwaves using EEG caps whilst people slept to figure out how we perceive the quantity of sleep that we’ve had. They found that how much sleep we’ve had is always under-estimated, and the time we were awake in the night is always over-estimated (1). As a result of this, our thoughts about our night’s sleep have an influence on perceived tiredness level throughout the day. 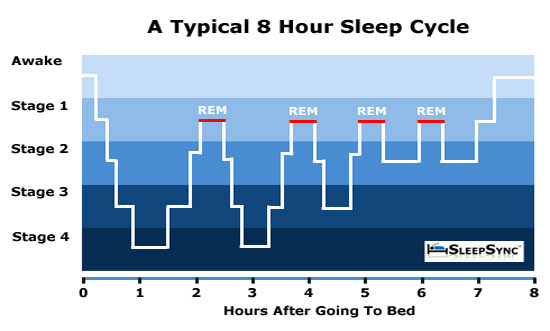 What should a typical sleep cycle look like? We all undergo sleep cycles when we go for a night’s sleep. 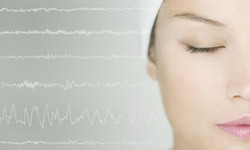 The typical sleep cycle has 4 stages of sleep, with our brainwaves slowly slowing down. Going through beta, alpha, theta, and delta brainwaves the deeper we go into a slumber. Delta sleep is the recuperative sleep where our body heals and restores our health. After stage 4 we have rapid eye movements (you may have heard of it as REM sleep), a very active part of sleep. REM sleep is a more alert state; our blood pressure is increases, our heart rate increases, and our body ‘moves’ in our mind (or actually moves in sleepwalkers!). We then drop back down to deeper and deeper levels of sleep visiting stage 4 again. A normal night’s sleep would include 2 visits to stage 4 for around 20-30 minutes each time. This is ALL we have, and ALL we need. If you have 2 visits to stage 4 you will be able to easily manage the next day ahead of you. Margaret Thatcher managed perfectly well with only 4 hours of sleep per night, and the great inventor, Thomas Edison, came up with invention after invention with a mere 3 hours of sleep! To function you don’t need a lot of hours, you just need to visit stage 4 a couple of times. So it’s clear that it’s not how much you sleep (the amount of hours that you sleep), it’s the QUALITY of your sleep, plus your PERCEPTION of it how good it was. Another common misconception we have is that you go into deep sleep for the whole night, but as you can see by the sleep cycle, this is not true. When we have a good night’s sleep we go up and down cycling through the sleep cycle and visit the deep sleep stages a couple of times. How does sleep influence chronic pain? Those who are experiencing chronic pain spend a lot of time in light REM sleep. This means that they could have 15 hours of this light sleep, but it wasn’t deep sleep so you wake up unrefreshed. People typically say “I can sleep forever, but I wake up and it feels like I could go to sleep again.” When you close your eyes, your conscious mind goes to the physical sensations of anxiety or pain, then your mind runs through what you might or might not be able to do tomorrow because of not having slept properly. It tends to be these racing THOUGHTS, as a consequence of focusing on the pain, that keep you awake, NOT the pain. It has been shown that sleep disruption (through worrying and thinking) affects pain severity more than pain severity affects your sleep (2). How did I think my way into this sleep pattern? Those of us who didn’t sleep well the night before will usually think “I wonder how I will be able to make it through the day” or “I’m tired because I didn’t sleep well, I HAVE to go to sleep tonight”. We then build up a pattern of anxiety through urgency to HAVE to have our sleep. We put pressure on ourselves to sleep and we don’t sleep because of this. Sleep is something we have to allow ourselves to do, not FORCE ourselves to do. What does an unhealthy sleep cycle look like? With unhealthy sleep, we tend to get to the light REM sleep more quickly and only go as deep as stage 2, i.e. there are no visits to the refreshing stage 4 sleep. REM sleep is used for subconscious problem solving. When our days are full of unresolved problems we either don’t have the time or the psychological energy to resolve, we go straight to REM to solve these problems, visit REM more often, and visit stage 4 less. People often remark that the more stressed you are the more weird your dreams become. It is your subconscious brain piecing together information to make sense of your problems through metaphors. What can I do to improve the quality of my sleep? 1. Products containing stimulants such as caffeine should be avoided at least 4 hours before bedtime. 2. Avoid nicotine (also a stimulant!) an hour before bedtime and when waking at night. 3. Avoid alcohol around bedtime because although it promotes sleep at first, it can disrupt sleep later in the night (the second half of the nocturnal sleep period (3). With alcohol in your system you are more easily woken up. You also develop tolerance to alcohol’s sedative effects rapidly, requiring you to become more dependent on alcohol and drink more alcohol each time to get the same sedative effect; “I can only go to sleep if I have alcohol before bed.”. 4. Avoid eating a large meal immediately before bedtime. Although a light snack may be beneficial. 5. Try to do regular (even mild works) physical exercise if you are able to during the day, but avoid doing this in the 2 hours before bedtime. 6. Keep your bedroom calm and tidy. Select a mattress, sheets, and pillows that are comfortable. We recommend Tempur memory foam products for a good night’s sleep, particularly the pillows if you have neck pain, and the mattresses if you have back pain. 7. Avoid making your bedroom too hot or too cold. 8. Keep the bedroom quiet and darkened during the night, but try to spend some time in daylight (or bright artificial light) during the day. Minimise lighting in your bedroom, as the artificial light, especially blue light such as that from laptops, phones and iPads has been shown to inhibit melatonin. Melatonin is the hormone that is only produced in darkness, helping to synchronise your natural circadian rhythm and help you to sleep. LED bulbs, LED televisions, and energy-efficient lightbulbs produce more blue light. Harvard University (4) recommends to use dim red lights for night lights “Red light has the least power to shift circadian rhythm and suppress melatonin.” They also recommend to “Avoid looking at bright screens beginning two to three hours before bed.”. If you need to use your computer at night, I recommend “F.lux”, a program that works automatically with your laptop or macbook to change the colour of your screen according to the time of day, working in-sync with your natural circadian rhythms. 9. Keep your bedroom mainly for sleeping; try to avoid watching television, listening to the radio, or eating in your bedroom. It is important to associate your bed with sleep and low levels of activity. 10. Try to keep regular times for going to bed and getting up. Avoid sleep during the day, this will shift your sleep pattern so that you are more awake at night when you are trying to get to sleep. As you can see there are many options for you to improve your sleep. If you are ready to start sleeping better and to get into a better sleep cycle pattern, we are in the process of creating a hypnosis CD to help you to habituate to a stronger sleep cycle as well as a handout with further information as to how you can take control of your sleeping patterns. If this is something that you would be interested in for yourself or for a friend, please contact the clinic or ask about it the next time you are in the clinic. 1. Means, Melanie K., et al. “Accuracy of sleep perceptions among insomnia sufferers and normal sleepers.” Sleep medicine 4.4 (2003): 285-296. Harvey, Allison G., and Nicole KY Tang. “(Mis) perception of sleep in insomnia: A puzzle and a resolution.” Psychological bulletin 138.1 (2012): 77. 2. Raymond et al. (2001). Quality of sleep and and its daily relationship to pain intensity in adult hospitalised burn patients, Pain, 92, 381-8.